This belief has been further reinforced by a few examples that I have come across. I covered the first example a few months ago, when I discussed the performance of the original members of the S&P 500 from 1957. The second example is from a completely passive fund that was set up 78 years ago. The Corporate Leaders Trust was created in 1935 with an equal number of common stock shares of the 30 leading U.S. companies at the time. The goal was to seek long term capital growth and income through investment generally in an equal number of shares of common stock of a fixed list of American blue chip corporations. 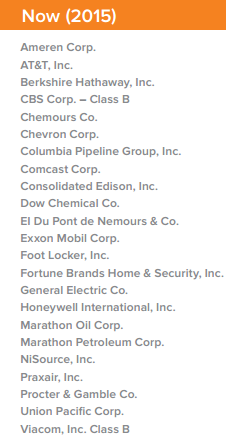 After 78 years, it is currently invested in a total of 23 leading U.S. corporations. The trust cannot purchase new companies, so holdings have changed only due to spin-offs, dividend eliminations, or mergers since fund inception. The Fund is a passively managed grantor trust registered with the SEC as a unit investment trust. The fund was expected to be liquidated by 2015, but its life has since been extended through 2100. There were only a few outright failures in the portfolio of the fund. However, what really helped results was the fact that the trust let winners run for as long as possible. As a dividend investor, I have learned that I should not sell, even if the stock I own is up over 1,000%. This is because it does not make sense to get rid of your winners, that will propel your portfolio forward, both in terms of capital appreciation and dividend growth. In a long-term portfolio that is held for generations, one could reasonably expect to have positions that result in mind-boggling returns over those decades. The changes are as a result of acquisitions, spin-offs, and dividend eliminations. When a company eliminates dividends or goes bankrupt, it is sold out. This is a testament of the power of selecting the leading dividend paying blue chips of the time, and then patiently holding for generations. Investors in the trust ignored all the fads of the next 78 years, and did really well by investing in businesses that stood the test of time. A diverse portfolio of mature blue chip companies with enduring business models will generate loads of excess cash for their shareholders, which could then be reinvested into more shares at depressed values. This is also a testament to the fact that the blue chip holdings are not expected to grow as rapidly as companies in hot new sectors, which is why those blue chips are perennially undervalued. As a result, dividends are reinvested into undervalued shares, which further turbocharges returns. When you have low expectations, valuations are low. However, if you manage to generate consistent earnings growth, this can result in very good investor returns. This is a superior strategy to the one where hot growth stocks are chased by unsuspecting investors who pay dearly for the chance to buy future growth, which rarely materialized to the extend expected. When you invest in a stock or a sector with inflated expectations, you pay a premium for it. If things do not go as expected, the valuation compression and the low increase in earnings serve as a double-whammy that prevents investors from realizing a gain. If you really sit and think about it, long-term investing is the best ally of the individual dividend investor. It allows you to quietly compound your capital by focusing only on quality blue chip dividend paying companies that have enduring business models, while ignoring the everyday noise that tries to make you to do something, when in reality there is no need for you to act. A 3% yield today might not sound like a lot today, but if you reinvest those dividends that grow at 6% – 7% annually for the next 30 – 40 – 50 years, the level of dividend income would be mind boggling. If you also look at that from the perspective of a company that grows earnings by 6% – 7%/year for that period of time, your wealth would be increasing a lot as well. The small yield today is the seed that will bring fruit to you and your family or charitable cause for decades to come. Do not waste it, but do the smart thing by investing it and watching it turn into a beautiful tree. So to summarize, this fund proves that a diversified portfolio of blue chip companies that regularly pay dividends, and adapt to the ever changing economy is a great way to build and maintain wealth and income. It is a living proof that passive buy and hold dividend investing works for those who are patient and have a long-term mindset.